MoreThe law firm of Gosselin & Dubord, P.A., in Lewiston, Maine, offers comprehensive legal services in a variety of practice areas to meet the needs of individuals, families and businesses throughout the region.Serving Lewiston, Auburn and the rest of Androscoggin County, the attorneys at the law firm deliver high-quality, cost-effective representation and legal counsel to clients who have legal issues involving any of the following:• Residential and commercial real estate• Creditor...The law firm of Gosselin & Dubord, P.A., in Lewiston, Maine, offers comprehensive legal services in a variety of practice areas to meet the needs of individuals, families and businesses throughout the region. Established in 1987, the law firm has become a staple of dependable legal assistance and support to members of the local community over the past 30 years. Each of the firm's three attorneys is a native of Maine, and combined, they possess nearly 100 years of legal experience. This means they have the knowledge and resources necessary to handle the demands of any client's case regardless of the complexities or challenges involved, and they are fully committed to providing the personalized service and practical advice their clients deserve in order to help them obtain their specific needs and goals. 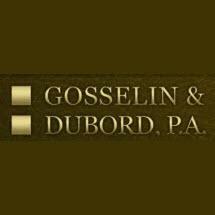 To receive the highest level of professional counsel and representation possible for your legal issue and to help you protect yourself, your family or your company for the future, you can contact Gosselin & Dubord, P.A., to schedule an appointment for a consultation.